This figure was the only figure in the entire Kenner collection to be carded on a Canadian Power Of The Force card, though there is no definitive proof that it was ever sold in Canada. It was also package for the European market on the Tri-logo card. This figure was never domestically available in the United States. Comments: Much like the Vinyl Cape Jawa and Blue Snaggletooth, Yak Face will always be a famous and sought after Star Wars collectible, both from die-hard collectors in the Star Wars community and outside as well. Though considered to be quite rare, eBay has proven to have them available in fairly decent quantities on a nearly daily basis. Nonetheless, it?s perceived to be unbelievably rare -which isn?t all together true- and therefore warrants higher than average prices. Major Variations: Though all vintage figures have minor variations, the Yak Face action figure has no known major variations. 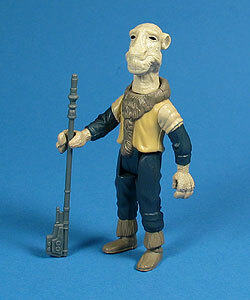 It is important to note however, that the Tri-Logo version of this figure was often packaged with Palace Blasters (both gray and black) and Bespin blasters (Blue), but over all these are considered as errors, since the vast majority of Tri-Logo Yak Face action figures were packed without any accessories whatsoever.